"SEA JET - P6M Seamaster, a near supersonic swept wing sea plane will join the Fleet as an important ASW Weapon. THE P6M Seamaster, a swept wing seaplane powered at near-supersonic speeds by four jet engines, has been assigned a leading role in antisubmarine warfare even before it has completed flight tests. Forthcoming production models of this 600-mile-per-hour minelaying seaplane will be used to strike at enemy submarines in their home ports in the event of any big war. Refueling from submarines or other small units en route, the long-range seaplane could deliver mines or nuclear weapons against any target within range. This includes any target that lies within 2000 or more miles from the Seamaster tenders or advance bases. Seamasters deployed with the Fleet might be dispersed in small units within striking distance but out of the range of surprise attack. They might fly missions from one base, then move to a sheltered bay or cove to be serviced by a tender or advance base crew. Flight tests now being conducted are a resumption of a test series which ended with the loss of the first two experimental planes of this design. The new prototype Seamaster has many improvements over the earlier models and five more P6M aircraft are now under construction and will be delivered to NATC, Patuxent River, Md. The six evaluation planes, designated YP6M-1, are powered by four J-71 turbo)et engines. Eight additional Seamasters under construction (P6M-2) will be driven aloft by J-75 turbo)et engines. The plane now undergoing tests has its jet engines, mounted on top of the sharply swept back wings, wanted outwards to avoid heating :he fuselage when the two inboard afterburners are used. This heating was experienced on earlier models of the new plane. Other design improvements made on the new models include an improved configuration of the engine nacelles to increase engine performance and addition of a new tail fin fairing at the top of the fin to reduce in-flight drag. This versatile aircraft can per form high-speed photo-reconnaissance as well as minelaying and bombing missions. It has the latest in aircraft equipment. The bow contains a radome and behind it are the pressurized flight deck and crew's compartment. Here the pressure never falls below that found a 21,000 feet even though the plan may be flying at 50,000. The crew includes a pilot, copilot, navigator, bombardier and radio operator. Behind this pressurized cabin is the mine bay which extends up into the wing section. This rotary unit is watertight an can be loaded with mines, supply or camera pod while the plane is its beaching gear or afloat. If necessary the rotary mine bay can be removed and replaced with a loaded unit. A large mine-loading hatch is located in the top of the hull aft of the wing directly over the mine-loading compartment. If it is necessary for the crew to go into the tail section during flight they can travel on an overhead track and trolley system. The wings (span, 100 feet) are tipped at each end with metal floats. When the Seamaster is down on the water the wing tips touch the surface and these floats provide additional stability. Once these planes become fully operational they will be examples of the mobility of sea power. The force of P6Ms will be able to roar over a target at high altitude to launch their nuclear bombs against submarine bases or shipyards, or, under different circumstances they can take off on a mining mission that will find them streaking at nearly top speed a few feet above the water. When the mines have been dropped the plane will turn for home, but this time it may be a new home a thousand miles from the point where the flight began. A tender vessel (landing ship, dock; submarine, or Seaplane Tender) will be waiting for the arrival of the combatant P6Ms. The importance attached to this ability by defense officials marks the resumption of P6M tests as a significant advance in the development of a major new ASW striking weapon. -William Prosser, JOC, USN"
By the summer of 1959 all-Navy crews had begun flying three P6M-2's completed so far, and it appeared that operations could begin by early 1960. Rising costs, however, had led to two cutbacks, reducing the number of production items to eighteen, then eight. Then the bottom dropped out altogether. Citing "unforeseen technical difficulties," the Navy cancelled the entire program on August 21. The decision was and still is highly controversial. More than $400 million had been spent on the project, but during its long gestation period newer technologies had emerged. The development of the Polaris ballistic missile and submarine had finally given the Navy its strategic deterrent. Further, the atomic powered carrier Enterprise was going into service with long range nuclear capable strike aircraft, namely, the A3D Skywarriors and supersonic A3J Vigilantes. No complete plane exists, though there are several bits and pieces still extant. It was Martin's last aircraft project. A lot of parts there are not. No 'working' bits either. Most odd. Apparently the kit does not fit well as everyone I know who has built one in the last 10 years complained mightily about the lack of fit. 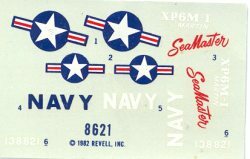 What it does have are the required rivets and decal placement marks prominently located on the kit parts. That way, if you mess up the decals, you can paint on the markings! A small section of sea is used as a display stand. The kit has no interior to mess with. My copy had a broken windscreen, but that shouldn't be too much of a hindrance to most modelers. 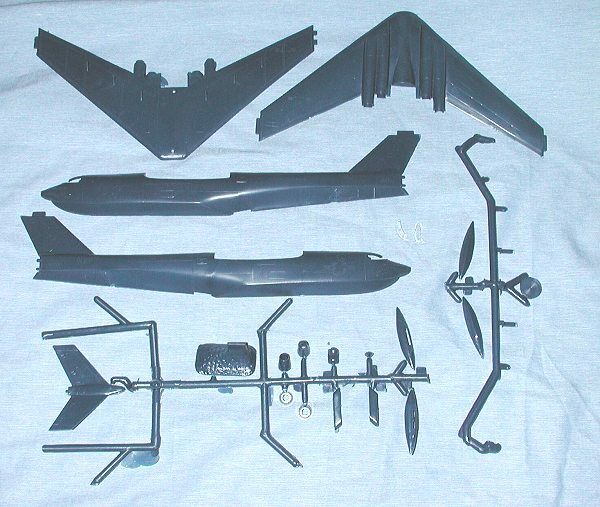 For those wondering, this kit is the P6M-1 version with the straight engines. The -2 version has several airframe differences including engines that angled outward. Instructions are relatively new and were done just for this 1982 boxing. Some color information is given, but the box art is your best guide. Decals are very glossy, but my experience with them is that they 'may' work well . Or they may be a total wash. It is tough to say. No aftermarket options are available so if they are a mess, break out the paint! By all accounts this isn't an easy kit to build. However, one thing is certain, you won't find anyone else doing one anytime soon! Various place on the net. Type 'P6M Seamaster' into a search engine. If you would like your product reviewed fairly and quickly by asite that has well over 150,000 visitors a month, please contactme or see other details in the Note toContributors.